When we see travel deals, we always want to spread the word. So as we see them, we make sure to let you know. They run the gamut from hotels to flights to points to miles to car rentals and even stuff you need while you’ll traveling, like equipment, Uber discounts, theme park tickets, food for when you’re on the road, etc. Heads up that some of these deals might be really limited in time or amount, or some could go on for days or longer. Some deals might be good for some people and not so much for others. There may be better deals out there and we just don’t know about them. We take no responsibility for any transaction you may or may not do; we’re just telling you what’s we’ve seen that’s out there at that very moment and it’s up to you to decide if it’s something useful, beneficial and worth it for you, and if you can take advantage of it before it’s too late. Groupon: If you make a new subscription to Groupon using this link, and make your first purchase of $10 or more within 72 hours of subscribing, you can earn $10 in Groupon Bucks. Google Express: Need something in a hurry for your travels? Start your shopping on this page and save an additional $10 off your first Google Express order. Ebates: If you make a new subscription to Ebates using this link, and make qualifying purchases totally $25 or more that earn Cash Back within 1 year of signing up, you will receive a $10 Cash Back bonus. Hilton: Join Hilton Honors (Hilton’s loyalty program) using this link, and if you’re a new member, earn 2,500 extra points after your first stay (sign up and stay must occur on or before December 15, 2018). Full disclosure for the deals above, and for deals marked “Groupon” below: If you use our referral codes or links, we may get a small kickback, which helps pay the bills here at Your Mileage May Vary. United Airlines: They’re having a flash sale! Offer ends July 26, 2018. Disney Havaianas: Select styles and patterns of these flip flops for kids are on sale for 50% off. Offer ends July 26, 2018. 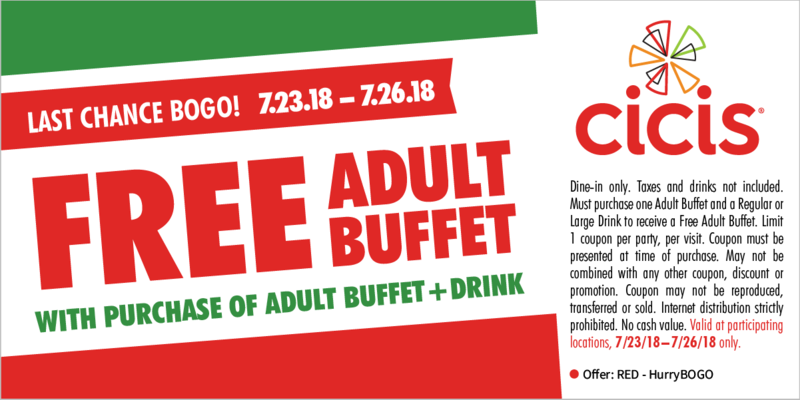 Cici’s Pizza: Buy an adult buffet and a drink and get another buffet free with this coupon. Offer ends July 26, 2018. Disney Backpacks & Bags: Select styles and patterns are on sale for upwards of 50% off. Offer ends July 26, 2018. Cirque du Soleil: Corteo (Nashville): Save 25% off tickets for shows on July 26, 27, 28, 29. Offer ends July 29, 2018. Auntie Anne’s: Buy one pretzel and get another free with this coupon. Offer ends July 30, 2018. Hampton Inn: Save up to 15% off with early booking. Offer ends July 30, 2018. Sixt: Same up to 55% on long term rentals. Offer ends July 30, 2018. Red Roof Inn: Seniors age 59+ (with proof of age) receive a 10% discount at all locations. offer ends July 30, 2018. American Tourister: 30-70% of American Tourister backpacks, underseat carry-on & huge variety of other bags. Sale ends July 30, 2018. Dairy Queen: Instead of celebrating National Ice Cream Day on July 15, Dairy Queen celebrates ice cream month. To join in on the fun, download their app before the end of July to get a voucher for a free small Blizzard. Offer ends July 31, 2018. Raniaco Inflatable Travel Pillow With Sleeping Eye Mask & Ear Plugs: $4.99 (originally $11). Offer ends July 31, 2018. Genghis Grill: Get bottomless bowls for the price of a single large bowl. Offer ends July 31, 2018. Samsonite: Weekly Steal! Great deals on select Samsonite bags! Offer ends July 31, 2018. Arby’s: Arby’s has small Coke Floats for $1. Offer ends July 31, 2018. Applebee’s: Their July drink special is Grey Goose and Cranberry for $3. Offer ends July 31, 2018. Chili’s: Get a Fireworks Margarita for $5 every day in July. Offer ends July 31, 2018. Enterprise Rent-A-Car: Save 15% off your rental in Costa Rica or Latin America & The Caribbean. Offer ends July 31, 2018. Vera Bradley: 50% off select patterns and styles. Offer ends August 1, 2018. Enterprise Rent-A-Car: Save 10% off your rental in the UK, Germany, Ireland, France, Spain, Offers all end August 1, 2018. Dickey’s BBQ Pit: $22 dinner for two special. Offer ends August 5, 2018. TripDock 6-Piece Packing Organizer & Bag Set: For sets that are regularly $21.99, price drops to $15.37 with coupon code 66V44TBP. IHOP: Buy a $25 gift card online and get a $5 bonus card. Bonus card must be used by Sept. 12, 2018. Offer ends August 12, 2018. Absinthe Las Vegas: Save 30% off reserved seats (Reserved Seats are $74 (reg. $109) for Monday-Thursday shows at 8 p.m. and 10 p.m., and Sunday shows at 10 p.m., between July 9 – Oct. 17). Offer ends August 17, 2018. U.S. National Parks: If your child is in 4th grade (or homeschooling equivalent) this year, your family is eligible for a FREE 1-year National Parks Annual Pass (offer is good through August 31, 2018). Topwolfs 22″ Waterproof Canvas Travel Duffel Bag: Regularly $69.99, use coupon code 4HSK4TXL to cut price to $34.99 (and free shipping!) Offer ends August 31, 2018. Hwy 55 Burgers, Shakes & Fries: Get a Lil’ Hamburger & Hot Dog, plus tots or fries and a drink for $7.99. Offer ends August 31, 2018. Enterprise Rent-A-Car: Save 20% off your rental in Poland or Israel, or 10% off your rental in Greece or Portugal. Offers all end August 31, 2018. Blue Man Group NYC: Save $36 on Orchestra level seats (regularly $85 ea) for shows through Sept. 30, 2018. Offer ends Sept 1, 2018. Olive Garden: Buy one of seven select entrees starting at $12.99 and receive your choice of four select entrees at no extra charge. Offer end September 23, 2018. SeaWorld & Aquatica San Antonio Flex Ticket: Enjoy unlimited admission to SeaWorld & Aquatica San Antonio for 5 consecutive days. Save up to $59 when you purchase at least 3 days in advance of your first visit. Ticket is valid 72 hours after time of purchase eTicket expires September 28, 2018. Offer ends September 23, 2018. Rubio’s Coastal Grill: Save $2 off a grilled swordfish bowl with coupon. Offer ends September 30, 2018. Blazing Tomatoes (I-Drive, Orlando): 10% off your meal, with coupon. Offer ends Oct. 31, 2018. NASCAR I-Drive: Save 20% off a race with coupon (coupon in link). Offer ends October 31, 2018. Walt Disney World Magic Your Way Tickets via Southwest Vacations: Book a flight + hotel vacation package to Orlando, and save $20 when you add a 3-day or longer Magic Your Way® ticket to your vacation package. Travel must take place by November 1, 2018. Offer ends 6pm CT on October 31, 2018. Lost Caverns Adventure Golf (I-Drive, Orlando): Save $3 per person, up to 6 people. Offer ends October 31, 2018. Wonderworks Orlando: $4 off gate price with coupon (coupon in link). Offer ends December 25, 2018. Seven Three Distillery: Save 50% off distillery tour and tasting for 2 or 4 people. Offer ends December 30, 2018. Enterprise Rent-A-Car: Save 10% off your rental in New Zealand or Australia. Offers all end December 31, 2018. Oahu: All Day Island Tour: $69 for one person (regularly $120) or $135 for two (regularly $240). 8-hour tour inclused bus stops at Diamond Head, Holona Blowhole, Dole Plantation, snorkeling & more. Offer ends February 28, 2019. Southwest Rapid Rewards Points: Earn up to 2,400 points with a reservation at Alamo, Avis (also save up to 35%), Budget, Hertz or National, or 1,200 points with a reservation at Dollar, Payless or Thrifty.